These two daisies make me think about life. They're a part of nature and indeed part of this world just as we are. When I took this photo, I was just walking by and I looked down. I was drawn to taking a photo because they made me think of faces. 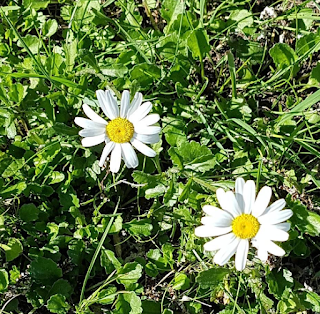 Daisies often remind me of smiling faces. These two are missing a petal or two here and there, but they're doing their best to show up in the best way they can...while being the best version of themselves with what they have. Thinking of this reminds me of a quote by the late tennis champion Arthur Ashe.